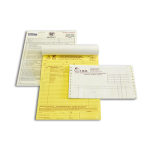 Carbonless (NCR) forms are quick, clean and easy to use. The right forms can save your employees and your customers valuable time, while keeping you organized by collecting and storing the important information you need to run your business. We offer complete NCR form printing, including: 2-Part, 3-Part, 4-Part & 5 Part forms; black or color ink printing; padded booklets; perforation and more . . . in a wide variety of standard and custom sizes. Padded one part forms can save your employees and your customers valuable time, while keeping you organized by collecting and storing the important information you need to run your business. We offer complete padded form printing, including: black or color ink printing; padded booklets or glued sets; optional covers and/or cardboard backing; perforation; sequential numbering; and more . . . in a wide variety of standard and custom sizes. Loose forms are the easiest type of form to distribute to individual clients for completion. Loose forms also have the advantage of being easy to photocopy or slide into a client’s individual file. We offer complete padded (booklet) loose form printing, including: black or color ink printing; one or two sided; perforation; and more . . . in a wide variety of standard and custom sizes.